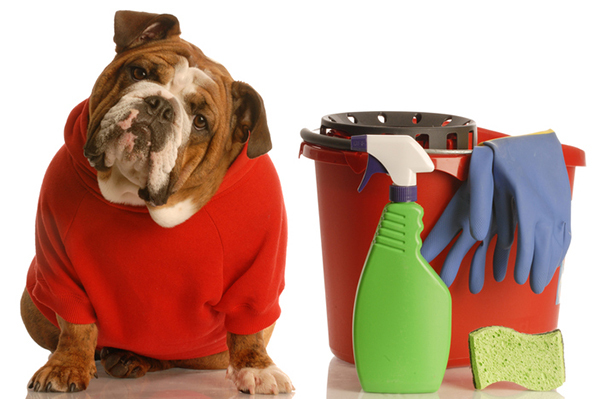 Are your household cleaners safe for dogs? We point out which cleaning products are toxic... and some good alternatives. Meet the breeds that are true masters at shedding. But we're happy to clean up after them anyway! We offer our best DIY formulas and tips for cleaning canine stains and odors, from a lifetime of caring for dogs. You can spring clean your home any time of the year, and when you do, keep your four-legged family members in mind. Isn't it amazing how the sweetest creatures on earth can leave the foulest messes in our homes? We've yet to meet a dog who can clean up after himself -- that job falls to humans. Here's how to get it done quick and easy. Can You Tell When Your House Smells Like Dog? Sometimes your nose knows, sometimes you're so used to it that you can't tell. What to do? Let’s Talk: Do You Let Your Dog Lick Your Dirty Dishes Clean? I've been known to let my dog "prewash" my plates. How about you? Or have I just completely turned you off? I have the SpotBot by Bissell and I absolutely love it. I don’t know what I did without it! I don’t use their cleansers for all spots, though. If the stain isn’t too bad, I just spray on my Woolite with Oxygen for Pets and put water on it. How do you get rid of old puppy pee stains? I have one carpeted room that seems completely wrecked with old puppy pee stains. It reeks and I need to get it clean tomorrow! Yikes — what should I do? What is the best way to clean doggie slobber from walls? What can I do about doggie diarrhea stains on the carpet? Anyone have any suggestions for a affordable deep cleaner to clean the messes my Rottie has made on the carpet and what soap to use with it? What’s the best way to remove pee stains? What is a good odor elimnator for carpets? Looking for the best products out there. What can I put inside the vacuum to keep dog odors out? Would moth crystals in the bag help?